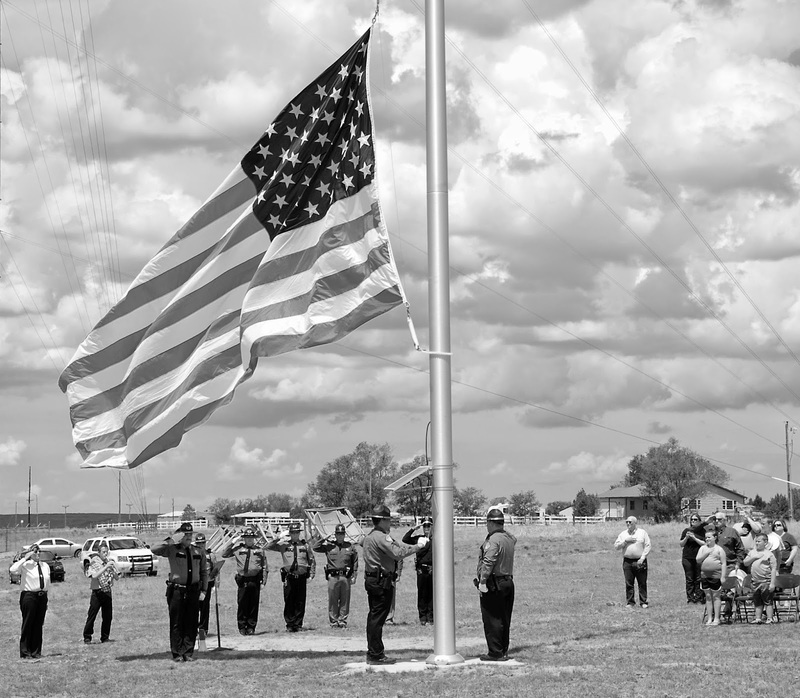 FLAGPOLE DEDICATION – In a ceremony on Memorial Day, the Town of Hugo dedicated its new 70-foot-tall flagpole which was a project by the Hugo Economic Development Group (HEDG), a subcommittee of the Hugo Improvement Partnership (HIP). Mayor Patsie Smith and Marshal Joy Hemby spoke during the ceremony. An honor guard from the Lincoln County Sheriff’s Department conducted the flag raising. The flagpole is located on north side of town inside the Hugo walking path and near Road 2X. The large 18x25-foot American flag, which will be flown 24 hours a day and illuminated by a solar-powered light, is clearly visible to travelers on Highway 40/287.